ARDEX CA 20 P™ is a one-component, modified silane, polymer adhesive and neutral curing sealant that hardens in reaction with moisture. ARDEX CA 20 P is extremely flexible with excellent bond strength, making it suitable for a wide range of applications. It is ideal for replacing tiles or for use as a general shower, kitchen and bathroom repair adhesive and sealant for fitting accessories such as soap holders. ARDEX CA 20 P is shrinkage free and can be used to fill movement joints. Use on interior or exterior walls and floors. 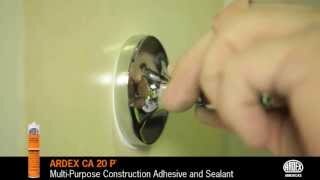 ARDEX CA 20 P is ideal for bonding most construction materials, including glass, tiles, ceramics, wood, plastic and metal. Storage Conditions: 40⁰F – 90⁰F (5⁰C – 32⁰C). Max 50% relative humidity. Do not freeze or expose to moisture. Coverage per Package: 1/4″ (6.35 mm) Bead. 32 linear ft. (9.75 linear m). 1/8″ (3.18 mm) Bead. 64 linear ft. (19.5 linear m). Rehabbing this tile pool utilized a complete system lineup of tile products.